Very closed to the Francois-Mitterrand library, at the corner of Rue du Chevaleret and Domremy, "Le Débonnaire" symbolize the Parisian authenticity, the entire world envies us. No pseudo sincerity, no. "Le Débonnaire" does not settle with the restaurants fashion conceptualized by calculation: it is in our nature to be welcoming, friendly and respectful of our customers. Which, from 7 am to 2 am, put together the neighborhood: local, student and workers. A drink with friends or a nice meal with friends will be appreciated, with a carefully selected and never intrusive music. 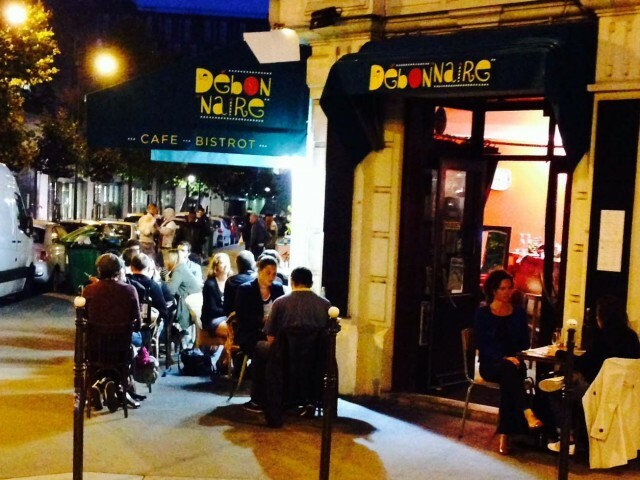 At "Le Débonnaire" you can lunch or diner cool, original and affordable meal. The chef serves traditional cuisine as bolder culinary creations. Commited in the protection of the planet, "Le Débonnaire" take into account ecological issues. The bistrot sign charters, recycles its waste, and fight against overfishing.